Bridget Jones is a woman in her early thirties who makes a new-year resolution to take control of her life and to help her to do this she keeps a diary. 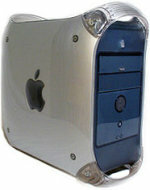 Powermac G4s are used in Bridget Jones' office. Bridget flirts with her boss using the Powermac. They're hidden under the desks.